Galbraith has brought to the market two finished houses and eight further plots of land at Stronvar overlooking Loch Voil, offering spectacular views of some of the most stunning scenery in Scotland. 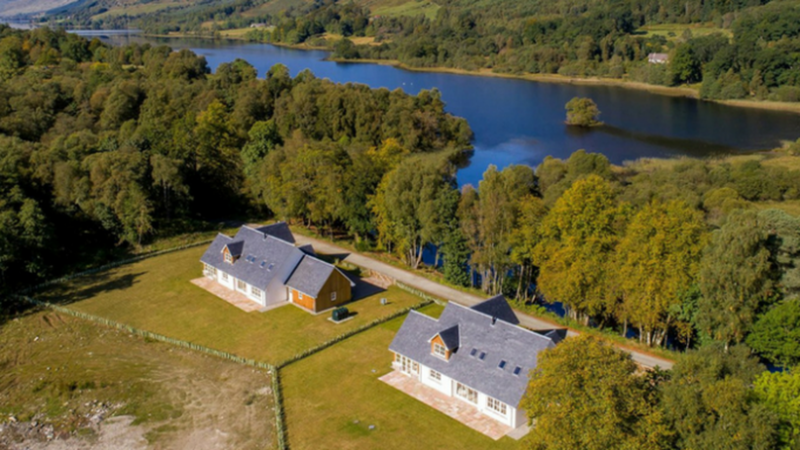 Each of the plots at Stronvar offer shared ownership of approximately ten acres of land, including woodland and a Site of Special Scientific Interest plus a launch point for a non-motorised boat / canoe on Loch Voil. Detailed planning permission has been granted for each of the plots to create a luxurious family home. Purchasers will also benefit from a 'design and build' service from a team made up of some of Scotland's most respected builders and architects to create their own bespoke home sympathetic to the local area. The available home designs vary in size from 2,000 sq ft to 4,000 sq ft and make full use of local natural materials in their construction. The designs offer considerable flexibility, enabling the purchaser to design their own dream home (subject to planning approval). There is also ample scope to create a waterside highland garden. This really is one of Scotland's most beautiful locations and it is rare to have the opportunity to create a new home in such a position, with access to the loch and overlooking such amazing views. In addition, the service in place to begin designing and building your home, using the established architect and builder, takes away all the hassle of potentially having to search for a builder and architect yourself, while still providing flexibility. Stronvar is close to historic Balquhidder, and deep in the heart of Rob Roy country. The surrounding landscape is renowned for its magnificent highland scenery, and for the peace and tranquillity of the wooded glens and braes that surround the calm waters of Loch Voil. Stronvar is within the Loch Lomond and Trossachs National Park and is approximately 31 miles from Stirling and 55 miles from Glasgow. The two properties already built are 4-bedroom detached villas finished to the highest specification. Both are for sale for offers in the region of 575,000. The internal accommodation includes: Open plan entrance hall and dining room with feature multi fuel stove, breakfasting kitchen with door to sun room, living room, utility room, shower room, family room / bedroom 4. Master bedroom with dressing room and en-suite shower room, double bedroom 2, double bedroom 3, family bathroom and store room. The eight plots of land vary in size from 0.43 to 3.48 acres.